Peel the plantain. Peel will be tough to remove . Cut ends of the plantain and slice the peel long ways and remove by hand. In a large frying pan, fill with about an inch of oil and heat to medium heat. Once hot, place plantains in and cook for about two to three minutes on each side. 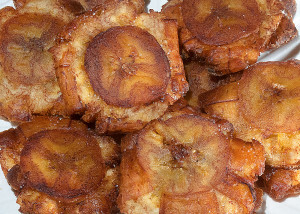 Take the plantains out and place on a paper towel or cookie sheet. Flatten plantains one at a time using a to stone press or placing one at a time between the underside of two plates and press down to about 1/2 inch in thickness. Place back into the frying pan and fry until golden brown on both sides. As soon as they come out, sprinkle them with salt a garlic powder, coat well and serve.